She may have been criticised in her native India for not losing her baby weight fast enough, but Aishwarya Rai Bachchan looked nothing short of dazzling at the AmfAR Cinema Against Aids gala in Cannes last night. Baby weight or not, the Bollywood actress, 38, lived up to her title of 'the worlds most beautiful woman' in a gold embroidered sari and co-ordinating tailored jacket with Mandarin collar. Her hair was piled high on her head and adorned with a slender gold band, while her make-up was understated save the dark eyeliner around her eyes. The former Miss World, who is married to Abhishek Bachchan, the son of one of India's best-loved stars, gave birth to her first child, a daughter, in November last year. She found international fame in the Hollywood film Bride and Prejudice, and Julia Roberts billed her as the world's most beautiful woman. But an unfortunate recent photograph that captured her with a double chin, sparked a flurry of cruel criticism, with some suggesting that she has a 'duty' to her fans to regain her pre-pregnancy figure. One website posted a video of the star looking less than her usual svelte self, flicking between photographs of her pre-birth, and photos now. 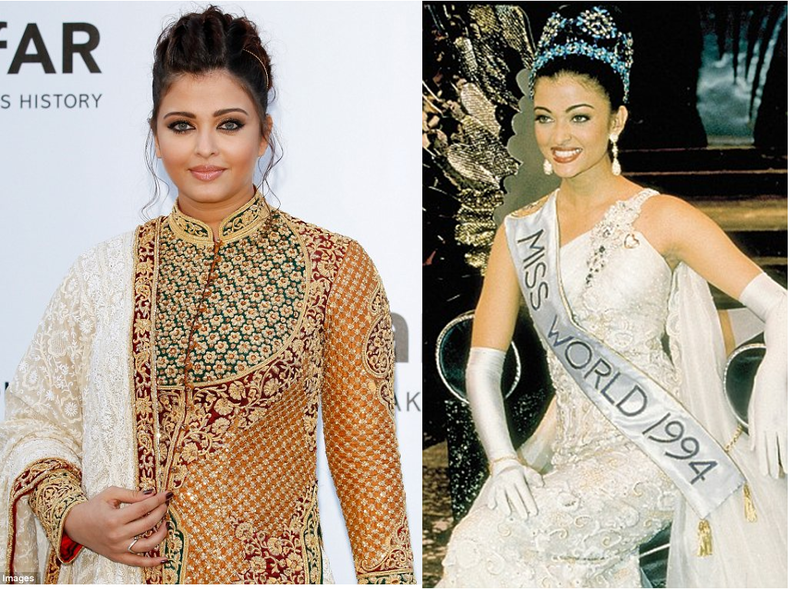 Called 'Aishwarya Rai's shocking weight gain', the clip, which came accompanied by elephant sound effects, has been seen more than 500,000 times. Dozens more videos in a similar vein have been posted, each with viewing figures in the tens or hundreds of thousands. Comments left after the video prove that many of those watching have little sympathy for the star. Mrs Rai-Bachchan has commendably remained cool-headed about the criticism, and has been open about the fact that she is in no hurry to lose the few extra pounds she gained during her pregnancy. She has said that she simply wants to 'enjoy motherhood'. Indeed, if last night's appearance at Cannes is anything to go by, she has little to worry about. Nor is she short of support in her goal to prioritise her new daughter. Though there is certainly more critique than praise, many have come out in defence of the star, saying that she, like any new mother, should be focusing on her infant, not her diet. Media commentators in India have said that expectations placed on the country's most famous stars are impossibly high. Cinema professor Shohini Ghosh told the New York Daily News: 'There is a glorification of motherhood in India and Indian cinema. what they're talking about on the internet. You actually know how to bring a problem to light and make it important. More and more people should read this and understand this side of your story. I can't believe you're not more popular since you definitely have the gift.